Read only the mainstream media and you’ll think that Americans evade $150 billion or more in taxes on offshore assets every year. Of course, as a Nestmann’s Notes reader, you know better. The estimates of offshore tax evasion are vastly overstated. They are based on an unsubstantiated guess by a former congressional staffer. That hasn’t stopped Congress from enacting a hodge-podge of laws requiring US taxpayers to disclose international investments. The requirements are often duplicative. And there are severe penalties for noncompliance. The reporting obligations are often poorly publicized. Congress first required companies and individuals to disclose international assets in 1960. Laws enacted in subsequent years expanded reporting obligations and dramatically increased penalties for noncompliance. Each law had its own justification and was often spearheaded by a special interest group. For instance, the fight against organized crime gave rise to a 1970 law that required individuals, domestic trusts, and business entities to report foreign accounts. The law, therefore, became part of Title 31 of the US Code that deals with money and banking rather than Title 26, which deals with taxes. Each enactment added to a tangle of uncoordinated reporting obligations and penalties. It’s difficult to navigate, even for international tax specialists. 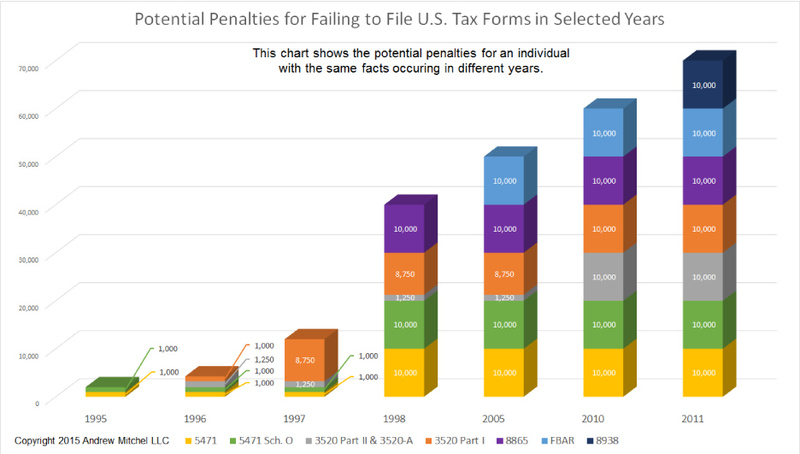 The severity of the penalties has increased dramatically, as international tax attorney Andrew Mitchel summarized in the chart below. One of the most common reporting forms is the Report of Foreign Bank and Financial Accounts (FBAR), otherwise known as Form 114. If you’re a US citizen or permanent resident, you must file an FBAR if you have financial interests in or authority over foreign accounts with an aggregate value of $10,000 or more at any time during the preceding year. The form is due the same date as your personal tax return (April 16, 2018) but must be filed electronically at a Treasury Department portal. Fortunately, you can get a six-month filing extension for this form by filing Form 4878 for your regular return. The penalties for noncompliance are draconian. You can be fined for each unreported account for each year you neglect to file the FBAR. And the penalties if you willfully fail to file the form are worse. Last month, the Treasury increased the penalty for failing to file the FBAR to $12,921 for each year you negligently fail to file. In the same announcement, the penalty for willfully failing to file the FBAR was increased to $129,210 or 50% of the balance of your foreign accounts, whichever is greater. It’s much easier for the government to prove “willfulness” than you might think. The courts have ruled that simply signing a tax return under penalty of perjury demonstrates willfulness. If you’re not sure you can sort out your reporting obligations before the tax deadline, you can get a six-month filing extension by submitting Form 4868. Do you know when the reporting threshold itself was last increased? That was way back in 1985 – more than three decades ago. If the $10,000 threshold was adjusted for inflation, it would now amount to $22,750. It can be hard to figure out if you need to report an international financial relationship on the FBAR or not. If you have signature authority over an account at an international bank or brokerage, this relationship is reportable. But the published guidance from the IRS on whether you must disclose details of other international relationships is unclear. IRS Form 8938 form came into existence after the enactment of the Foreign Account Tax Compliance Act (FATCA) in 2010. You need to file this form if you hold more than $50,000 of financial assets offshore. The thresholds are higher if you’re married or live permanently outside the US. You must file IRS Form 8621 if you have investments in offshore mutual funds. If you own an interest in a non-US business entity, you probably need to tell the IRS about it. Uncle Sam wants to know about even a foreign entity for something as simple as owning a retirement home in another country. The relevant forms are Form 5471 for foreign corporations; Form 8865 for foreign partnerships; and Form 8858 for foreign disregarded entities. The US grantor (i.e., the person funding) a foreign trust must file Form 3520-A annually. They may be required to file Form 3520 as well. Congress isn’t likely to simplify these rules. There’s a reason for that. Our leaders in Washington will do almost anything to discourage US taxpayers from making international investments. Confusing reporting rules and the blatant lies about the size of the “offshore tax evasion problem” discussed in this essay are intended to make offshore investors nervous. But there’s no reason for alarm. You simply need a professional on your side. Since seemingly simple international investments can give rise to complex reporting requirements, an experienced international tax expert should review your filings. It’s their job to help you understand what you need to report and what you don’t need to report. I explained this to members of our premium Inner Circle program in a series of articles starting here. What are you waiting for? A strong dollar has significantly reduced the foreign exchange risks of international investments for Americans. There’s no better time to go offshore! by a former congressional staffer.